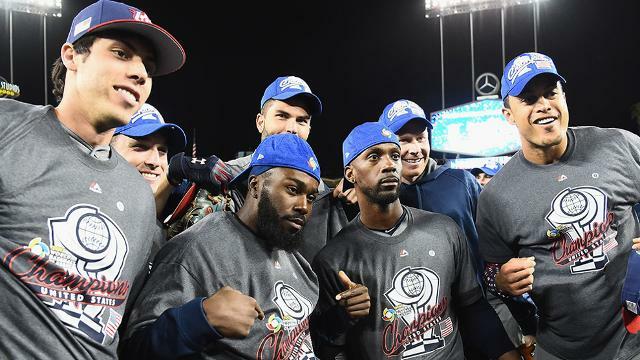 The United States got a brilliant pitching performance from starter Marcus Stroman and enough offense from its All-Star-packed lineup of Major League luminaries to beat Puerto Rico, 8-0, in the championship game of the 2017 Classic on Wednesday night at Dodger Stadium. Marcus Stroman dazzled for Team USA in the World Baseball Classic championship game Wednesday night, stifling a Puerto Rican lineup that had slugged its way through the tournament. 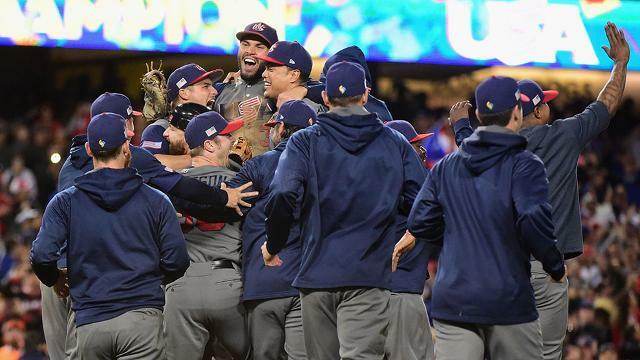 With Team USA's 8-0 championship game win over Puerto Rico on Wednesday night at Dodger Stadium, a thrilling 2017 World Baseball Classic is in the books after 40 games of great action. Following a thrilling World Baseball Classic that culminated in the United States winning its first title thanks to Wednesday's 8-0 win over Puerto Rico, World Baseball Classic, Inc. (WBCI) announced the All-World Baseball Classic Team. The top executives of Major League Baseball and the MLB Players Association conducted a joint news conference on Wednesday at Dodger Stadium, an hour before the start of the United States' 8-0 triumph over Puerto Rico in the championship game of the World Baseball Classic, and they were asked for their opinions on this year's installment of the tournament. The 2017 World Baseball Classic has reached its conclusion, and the returns say the tournament was one for the history books. The fourth installment of the Classic set new event records for attendance, television ratings, digital consumption and merchandise sales, Major League Baseball announced Thursday. 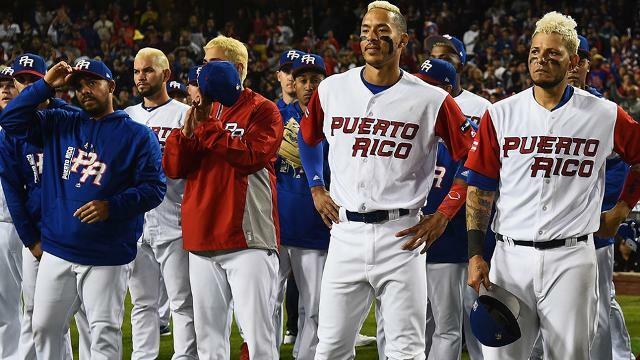 For the second consecutive World Baseball Classic, Team Puerto Rico fell one victory shy of winning its first Classic title, as an undefeated run through the first seven games of the tournament ended in an 8-0 loss to the United States on Wednesday night at Dodger Stadium. It's too early to gauge all that is possible as a result of a memorable 2017 Classic and the Americans who won it. But we know we're going to miss watching them, and they will miss playing with each other. At least they have golden reminders of their time together. 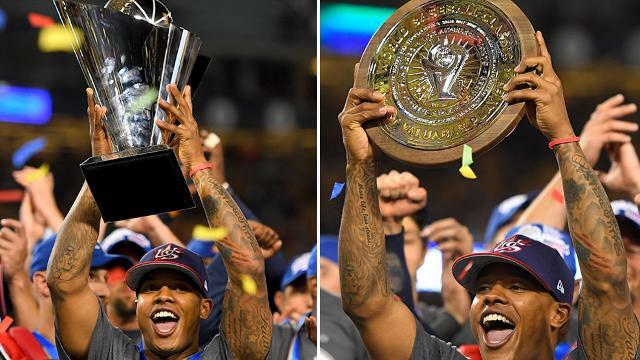 DYK: Stroman caps triumphant run for U.S.
With a memorable World Baseball Classic now in the books, here is a look at some notable facts and figures from Wednesday's final and Team USA's triumphant run. You heard the emotion in the words as they said it. You saw their faces and knew they meant it. To the players in the 2017 World Baseball Classic, the tournament was an enormous hit, a stunning success story that is only getting better every four years. Before the United States' 8-0 win over Puerto Rico in Wednesday night's championship game at Dodger Stadium, Adam Jones and his teammates got some bulletin-board material, courtesy of rumors that Puerto Rico already had a celebration planned. By coming out of retirement and guiding Team USA to its first World Baseball Classic championship, Jim Leyland may have given his resume the line it needed to secure a ticket to the Hall of Fame.